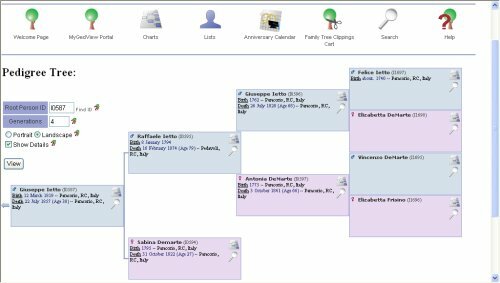 Many genealogy hobbyists have taken the time to chronicle their family history, but few have taken it to the next level. By creating a simple web site, you can preserve your heritage and gain access to the largest audience in the world, the internet. The internet provides an unparalleled opportunity for you to communicate with other genealogists who are researching the same surnames as you, and to find missing or unknown branches of your family tree. It is amazing how many people go to a search engine and type in their family name out of curiosity. With your presence on the web, these people will be directed to your site, where they can share their family history with you. It's also a great way to keep your family up to date with your research. We are genealogists first and foremost, and have been designing family trees and publishing them on the internet since 1995. We are well aware of the needs of the genealogist, and have worked closely with developers of genealogy software to accommodate these needs. As a result of these efforts, we are able to incorporate software, systems, and support that are unparalleled in their ability to communicate your family's history. Bring your family's history to life with a graphic display of your tree on the internet! What about all of the free hosting companies? Why pay for hosting at all? You always get what you pay for, and it is no different with web hosting. Of course, there are hundreds of companies that offer free hosting. However, one must realize that all of them cover their costs one way or another. Most of them will require that your site be over-laid with their advertising. Unfortunately, this covers up your own content, so that visitors end up having a hard time reading your page. Other companies generate annoying "pop-up" advertising windows every time someone visits your page. This generates more complaints from web users than anything except for spam (junk mail). And speaking of junk mail, one of the primary sources of junk mail is from bulk mailing companies who buy their mailing lists from these free hosting companies!